The Point Form Die (PF-1) puts the ogive curve on a lead or jacketed bullet. Normally, it is used after the core has been seated into the jacket in a core seating die, or for lead bullets, after the lead has been swaged to proper weight and nearly final diameter in a core swage die. But a special version of the PF-1 in type -S or type -H can be made to produce lead bullets in one stroke while adjusting their weight. Bleed holes must be made in the side of the die, intercepting the shank (parallel portion) of the cavity, to allow clean shearing of the extrusion when the bullet is ejected. The tip of the cavity must be closed against the pressure required to flow lead through the bleed holes by means of a closely fitted ejection pin, which must also be finely adjusted for exact length and position to stop exactly at the end of the cavity. The idea is similar to a LSWC-1 lead semi-wadcutter die. The difference is that a point forming die normally uses an ejector pin with a captive head, locking it to the press frame in the -S press. This pulls the ejection pin out of the die cavity, a short distance back into the ejection pin hole at the threaded end of the die, so that a jacket can be formed to a tight tip closure without crimping over the end of the pin and preventing ejection. 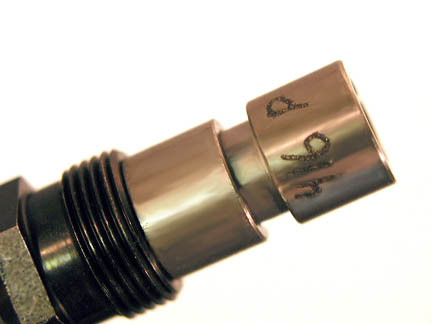 In order to seal the tip of the cavity so lead cannot flow up the ejection pin hole (which is only necessary because the lead will be pressurized to flow through the ejection pin holes), a very closely fitted pin and precisely honed ejection pin hole are required, and the pin must be fitted with a head that positions the pin tip exactly at the end of the die cavity. This means the ejection pin head will be similar to a core seat or core swage internal punch, and rest on a shoulder inside the S-Press ram. The -H point form die normally uses an internal punch similar to that used in other kinds of -H dies, because all the Corbin presses made for -H type dies use an ejector bar through the ram (knock out bar) to operate the ejection punch, and a large spring around the ram presses down on a retraction pin put through a hole in the internal punch head. Therefore, simply making the pin a very close fit and providing a way to adjust the ejection pin position relative to the die cavity will allow pressurizing the point form die fully. Unlike the -S press, no change in the point form internal punch head is required. Custom point forming dies are made in several versions. The one-stroke weight-adjusting lead bullet swage die is one of them, popular for paper patched bullet making. Another custom variation is the extra large diameter, high pressure point form die, which is used for swaging harder alloys or for materials that require more than standard forming pressure. Often these dies are also equipped with a honed and fitted ejection pin and ejection pin hole, with the pin length synchronized exactly to the tip of the die cavity for a pressure seal. This enables the bullet maker to form a finished lead tip bullet without using a separate lead tip die, for flat tips, and with some limitations, a cavity may be made in the ejection pin tip to finish some shapes of non-flat tips. The design cannot always be used for any shape, because the knife-like edge of a very sharp spitzer shape cavity would tend to cut into the bullet with the ejection pressure. Custom shapes that are not one of the stock Corbin designs (6-S, 1-E, ULD) may require building a new set of reamers and laps. The cost of doing so today exceeds the actual custom charge, but Corbin has always been a primary source for custom bullet designs, and we continue to provide custom work as a part of our legacy. Production tooling for standard shapes is paid for with many dies built with the same tools, which are made to last longer and cost even more to build as a result of the extra work and more costly materials used. Custom tooling usually makes one, sometimes two or three dies at most, and is therefore not built for high volume, in order to keep the costs in line. Custom diameters that vary more than a few thousandths from a stock size also require reamers and laps custom made, even in standard shapes. The same cost is involved whether a bullet swage die needs to be made in a custom shape or a custom size, or both at once, because in any of these cases a new set of reamers and laps must be constructed. Custom die diameter for higher pressure work. Adds a modest fee for additional material, extra time for making one blank from special size die steel stock. In -S dies, a 2-inch or even a 2.5-inch OD blank is used. In -H dies, a 3-inch or 4-inch OD blank may be used. 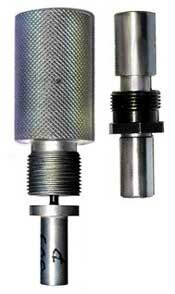 Custom synchronized or adjustable length ejector punch (internal punch). A custom punch charge applies due to the additional time in making the more complex parts and extra time for fitting and testing. This would be a requirement for a die with bleed holes, for weight adjustment of lead bullets. Also used for tip finishing in the point form die, instead of a separate lead tip die. Custom hollow point or tip finishing ejection pin. The ejection pin can also be made in special shapes to apply a specific hollow point shape, to press a plastic pin into the tip of the bullet, or to accomplish some other operation outside the normal scope of simple ejection. A custom punch fee applies. 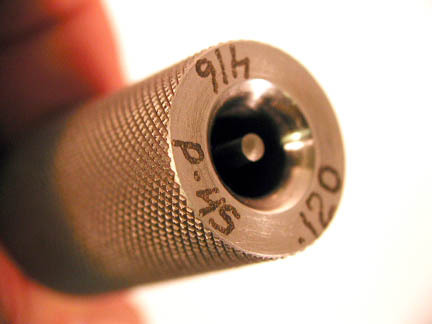 The external punch is marked with "P" to indicate that it fits a point forming die. The caliber of the die is also marked on the punch. The punch may be used with a LT-1 lead tip die, also, but typically the LT-1 die has its own external punch, so marked, even if it is otherwise identical. The point form internal punch has a unique shape, and is normally marked "P". It will also have the diameter of the ejection pin wire marked on the head. Punches of type -H have a hole through the head, which matches the 1/4-inch retraction pin used in the Hydro-Press, Hydro Junior, and Mega-Mite presses. Punches of type -M and -S have a slot in the head which matches the stop pin in the front of the CSP-1 Series II press. Punches of type -R has a spring-retracted button head. The point forming die has a "P" and the caliber marked on its mouth. The diameter of the ejection pin wire is also indicated, such as .081 or .120. The usual diameters are .061, .071, .081, .091, .108, .120. 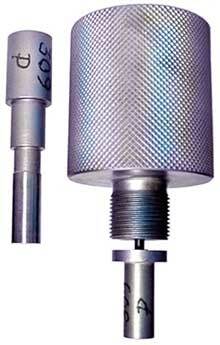 Larger diameters can be used for big calibers (over .458) or to make lead tip bullets with flat ends.